To cross the border into Zimbabwe seemed simple enough. The process was easy, it just meant standing in line for immigration for two hours, in the blazing hot African sun with out any shade. By the time we got to the counter to pay for our visas, ($30 USD payable in cash and if you don’t have the exact amount you will not receive change), we had made friends with fellow line goers and people would cheer when another person moved forward. 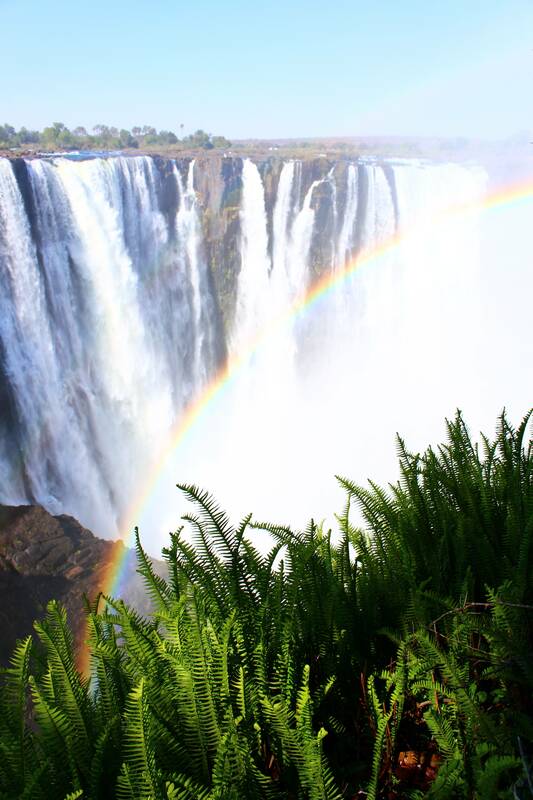 Once we cleared immigration, we walked across the border where we had a driver waiting for us to take us in to Victoria Falls, which is an hour drive away. 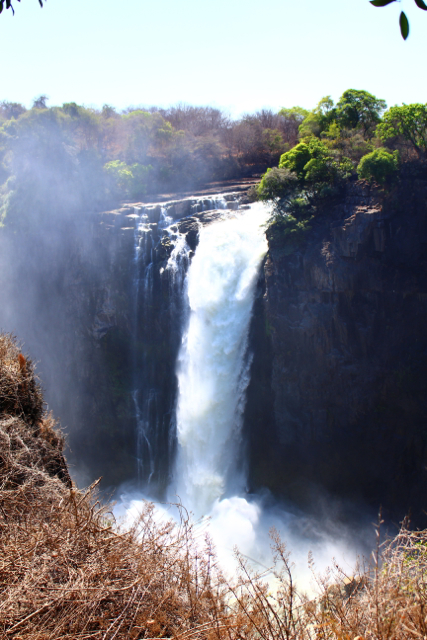 We still hadn’t figured out where to stay yet so we asked our driver and he recommended Shoestrings Backpackers, an inexpensive but decent place within walking distance of Victoria Falls National Park and town. The location was perfect and we had our own room with a bed (no more sleeping bags for us!) and a shower! Score! 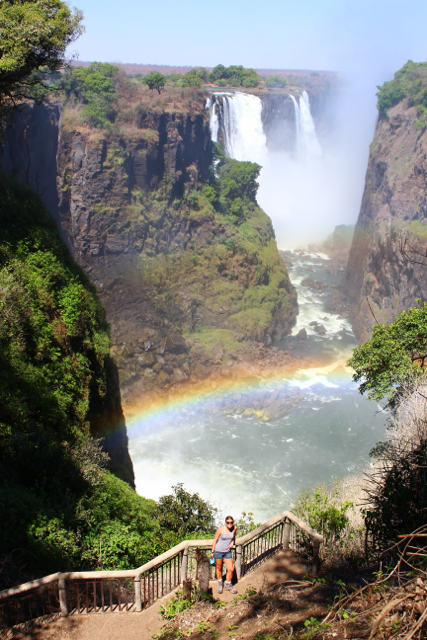 We got checked in, dropped our bags in our room and walked into town for lunch and then to see Victoria Falls. 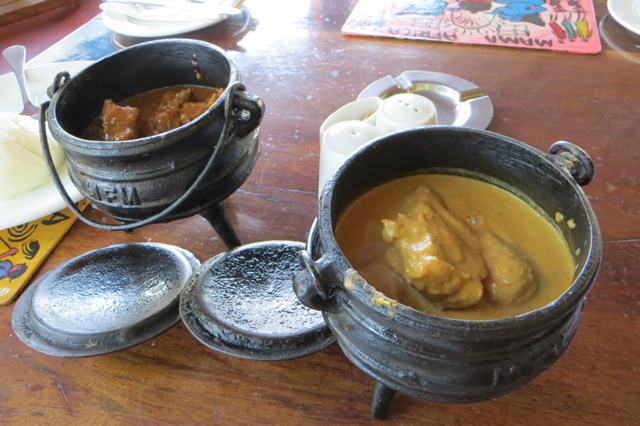 For lunch we ate traditional Zimbabwean food that consisted of a cast iron pot filled with either chicken or beef (cooked to the point of being as dry as the Kalahari) in a sauce. The flavor of the sauce was good but the meat felt like I was eating leather. This has been a trend throughout our travels in Africa, it seems that extremely well done is the norm, but I suppose I shouldn’t get sick from it. 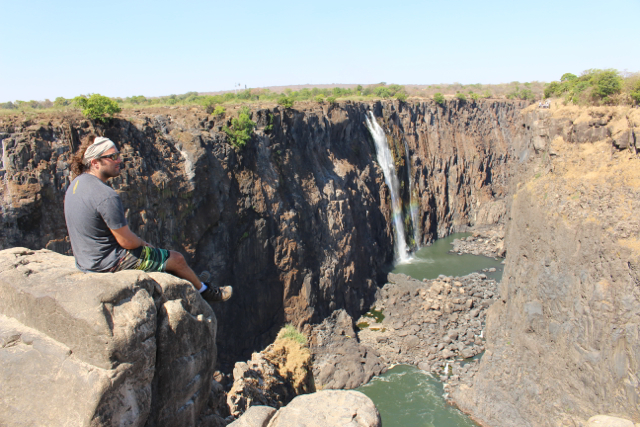 After lunch we walked to Victoria Falls. It was still boiling hot outside and I kept thinking that the walk along the falls for two hours would be miserable. 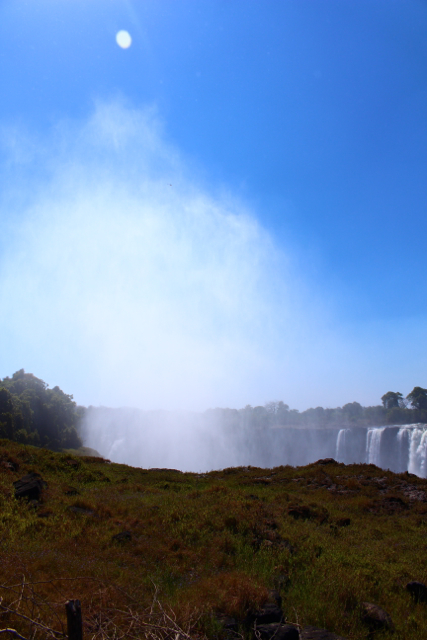 When we paid $30 USD a person to get into the National Park (everything in Zimbabwe is in USD and US prices so its not cheap) and began our walk I realized that the falls were generating an incredible mist that made the air cool and refreshing. The first overlook of the falls made me realize how massive it actually is. The sheer volume of water flowing over just that section was incredible. As we kept on walking, the mist was sometimes 300 feet above the top of the falls. In places the mist actually created its own little rainforest ecosystem with ferns and moss growing on the trees and the surrounding area was dry and desert like. The rest of our walk along the falls I just kept saying WOW! 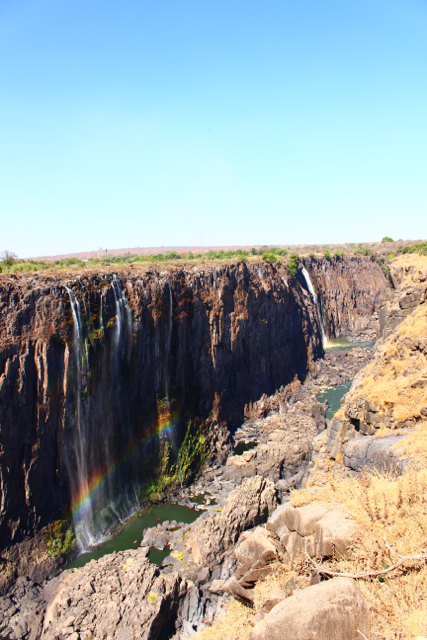 It was breathtakingly beautiful, and we were there during the dry season with low water flow! I can’t even imagine what it must look like when it’s at full volume! 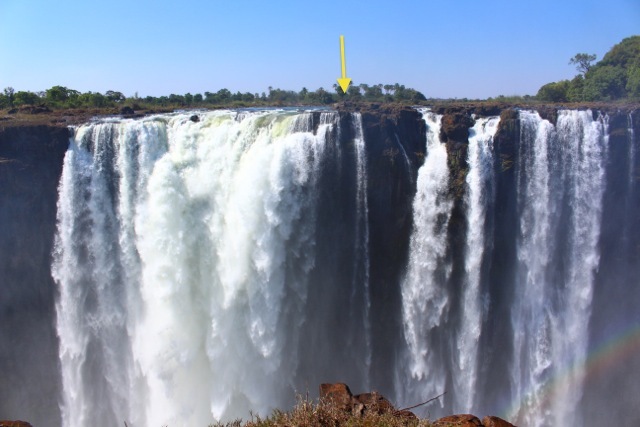 To give you an idea of scale, the yellow arrow is pointing to a man that was fishing in a tiny pool above the falls. 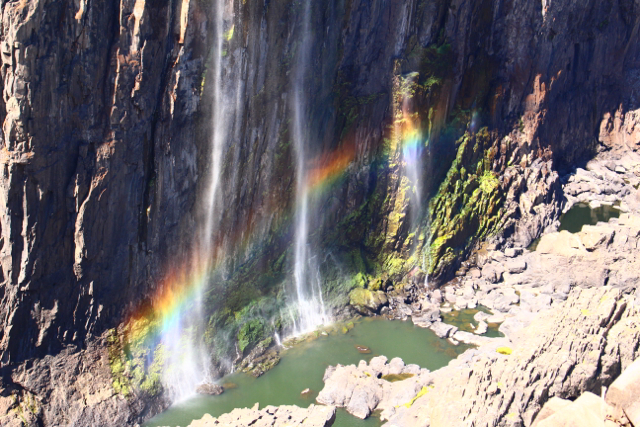 Note that you can’t see the bottom of the falls in this picture, it only depicts about 1/2 of the falls height. After our walk on the falls, we explored town a bit and then went back to our hostel to eat dinner and go over our pictures from our safari. While having a few Savanna Dry’s (a nice South African hard cider) we met another American. Meeting fellow Americans has been quite rare during our travels, especially American travelers like Mark, who is also traveling the world but unlike us, he is exploring it on a motorcycle. He is writing a blog, http://radiomanridestheworld.com that details his journey so far. It also has his inspirational story of caring for his wife who passed away from early onset Alzheimer’s and how he began his now 22 month long motorcycle journey around the world. We had a great time chatting with him and his riding partner, Jorg, a friend of his from South Africa. We went to bed tired, happy, and ready to head to the ocean the next day for diving the Aliwal Shoals in Umkomass, South Africa, after all, our gills were starting to feel a bit dry.